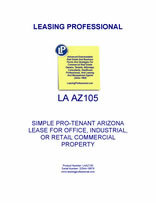 This form is for a single tenant Arizona lease where the tenant has superior leverage. It gives the tenant the right to use the premises for "any legal use," and has very abbreviated remedies for the landlord in the event of a tenant default. It is also pro-tenant in character because of the clauses it does not contain which customarily appear in pro-landlord forms relating to remedies and a variety of other pro-landlord provisions. 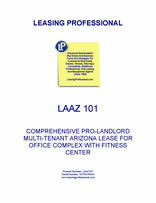 This form is designed for a multi-tenant Arizona office complex with a fitness center on-site where the landlord has superior leverage. Several exhibits are included with the form. The tenant is responsible for its pro-rata share of operating costs in excess of the base year stipulated in the lease. Arizona, the 48th state to join the US, was admitted in 1912. The state was a subject of vast exploration prior to becoming part of the US by Spanish and Mexican explorers. The US took posession of most of current day Arizona after the Mexican War in 1848. The remainder of the state was part of the 1853 Gadsden Purchase. Arizona's landscape is dominated by desert features, with mountains, plateaus and forests of Ponderosa Pine. Arizona's natural and agricultural resources, primarily in the form of copper, cotton and cattle spurred early economic growth. Later developments in tourism and technology helped to make Arizona considerably more populous over the past two decades.